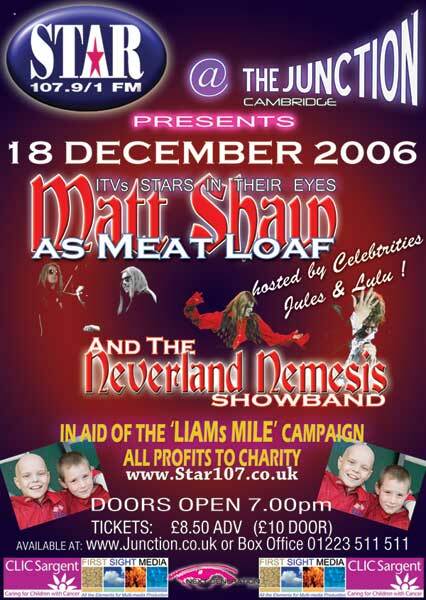 Star 107 FM in association with The Junction in Cambridge are delighted to announce that, on Wednesday 24th January 2007, Matt Shaw (as Meat Loaf) & The Neverland Nemesis will be performing a full rock concert. The Show will be hosted by personality, Julian Bennett, the Fashion Guru from Queer Eye For The Straight Guy UK and the Jules and Lulu Show! This concert was rescheduled from December 18th due to illness. Last edited by R.; 06 Jan 2007 at 15:59. Reason: Fixed colour issues.